Taiwanese violinist I-Jung Huang is the top prizewinner of 2017 Ima Hogg Concerto Competition and 2016 Hudson Valley String Competition; the Laureate of the 2015 Michael Hill International Violin Competition; the top prizewinner of TSO “The Young talent” competition; the Academy of Taiwan Strings Competition in Taiwan, and was the youngest musician selected at the Young Artist Taiwan Bank in 2011. She appeared as a soloist with Houston Symphony Orchestra, Hudson Valley Philharmonic; Taiwan Philharmonic, and Taipei Symphony Orchestra. During the school year of 2013-2014, she joined the CPP (Community Partnership Program) at the New England Conservatory with the Gioviale Quartet. She is actively organizing theme-based music projects in the United States, which bring out her creativity and passion about sharing music. Her project “TwoBows” has received partial funding through Juilliard Project Grant, which is a house concert tour programmed with unique chamber music repertoire, focusing on music that is unknown or underplayed. 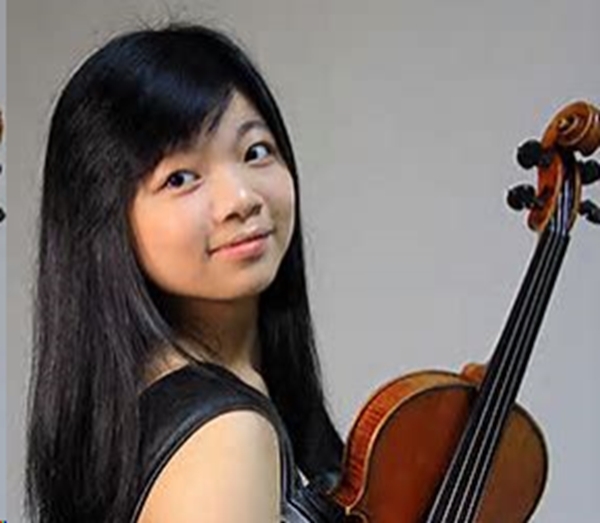 She has participated in several summer festivals and has received full scholarships, including the Perlman Music Program, the Ravinia Festival, the Four Seasons Winter Workshop, Kneisel Hall, and Taos School of Music, where she worked intensively with the members from the Guarneri Quartet, Borromeo Quartet, Shanghai Quartet, and Brentano Quartet. She has been invited to play with the New Asia Chamber Music Society, Orpheus Chamber Orchestra, Jupiter Symphony Chamber Players, and St. Paul Chamber Orchestra. She is a grant recipient of The Juilliard Career Grant and the 2018 Chimei Arts Award, and has been selected as a Young Artist in “2017 Music Star” in Taiwan. A recent graduate of The Juilliard School and the New England Conservatory, she has studied with Donald Weilerstein and Daniel Phillips, Miriam Fried and Nanette Chen. www.ijunghuang.com. Program: Vitali: Chacone; Schubert: Duo Sonata for Piano and Violin in A Major; Lutosławski Subito for Violin and Piano; Franck: Sonata for Piano and Violin in A major. Valet parking; Reception/wine: $90.